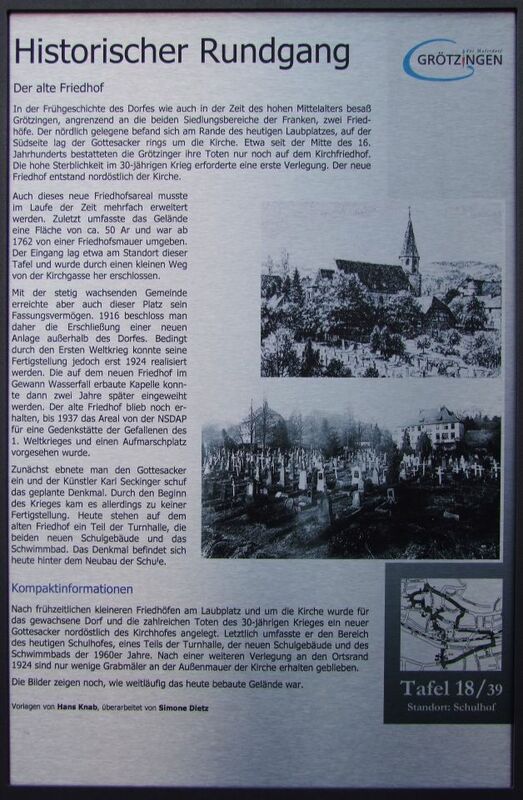 In the early history of the village as well as in the time of the high Middle Ages Grötzingen, possessed adjacent to the two settlement areas of the Franks, two cemeteries. The northerly was on the verge of today leaves the square, on the south side of the churchyard was around the church. Since about the mid-16th century buried the Grötzinger their dead only in the church cemetery. The high mortality in the 30-year war required an initial installation. The new cemetery was established north east of the church. Also this new cemetery area had to be expanded several times in the course of time. Last comprised the area an area of ? ?approximately 50 Ar and was surrounded from 1762 by a cemetery wall. The entrance was about the location of this panel and was developed by a small distance from the Kirchgasse ago. With the ever-growing community but also reached this place its capacity. 1916, therefore, he decided to open up a new plant outside of the village. However, due to the First World War could not be realized until its completion in 1924. The chapel was built in the new cemetery in Won waterfall could be inaugurated two years later. The old cemetery remained in effect until 1937, the area of the NSDAP for a memorial to the fallen of the first world war and a parade ground was provided. First, it paved a the cemetery, and the artist Karl Seckinger created the planned memorial. By the beginning of the war, however, there was no completion. Today, in the old cemetery are a part of the gym, the two new school buildings and the swimming pool. The monument is now located behind the construction of the school.